The title of Highway 101’s sophomore album is not, as you might think, the number 2. Rather, it is the symbol for squared. Pretentious title aside, the material isn’t quite as consistently strong as on their debut album, but it is still a very rewarding record, and helped to maintain them as one of the top country groups of the late 80s. The exuberant lead single, ‘(Do You Love Me) Just Say Yes’, was the band’s third #1 hit. It was written by Bob DiPiero, John Scott Sherrill and Dennis Robbins. She wants to stay friends, but it’s hard to see that happening. There was a change of pace for the third single, the urgent ‘Setting Me Up. This was a cover of an album cut by the British rock band Dire Straits, written by that band’s Mark Knopfler. Apparently he was unaware that his publisher had some country demos recorded of his songs, resulting in this and other cuts, but he did have some country influences – in 1989-90 his main project was a country-rock-blues band called the Notting Hillbillies, which also featured steel guitar legend Paul Franklin, and he later made an album and toured with Emmylou Harris. This song isn’t particularly country in its rhythmic structure, but was another to 10 hit, and allowed more of a band feel than usual, with some superb playing by the guys and a share of the vocals. Photoglo also co-wrote (with Wendy Waldman and Josh Leo) the solid mid-tempo ‘Road To Your Heart’. Will I wake up tomorrow without you by my side? It feels like the prequel to ‘Honky Tonk Heart’, and would have made another good single. A vibrant and authentic sounding cover of Buck Owens’ ‘There Goes My Heart’ reminds us of the band’s California roots. ‘Feed This Fire’ is an earnest love song written by Hugh Prestwood about the need to work at keeping the romance going; it was subsequently a hit single for Anne Murray. Paulette fights temptation she knows has no good ending in ‘Desperate Road’. Finally, Beth Nielsen Chapman’s ‘Long Way Down’ is a strong story song about a young woman musician who has fought her way to stardom from tough beginnings, but can’t rest on her laurels. While the album lacks the classics of their debut, this is a very strong follow up with no weak songs. I guess the end of the road comes for everybody and in this case the end of the road is actually the end of the #1 singles for Alabama, with “Reckless” being the band’s final Billboard #1 and “Cheap Seats” being the first single in fourteen years to miss the top ten. Cheap Seats was produced by Josh Leo and Larry Michael Lee, and was released in October 1993, with three singles released from the album (“Reckless”, “T.L.C. A.S.A.P.” and “The Cheap Seats”). The album was the second consecutive album to miss the top ten on Billboard’s Country Albums chart, reaching only #16, their worst showing to-date on RCA. Although the next four albums would chart better, even reaching the top ten in two instances, it was becoming clear that Alabama was no longer a dominant force in country music. Despite this, I really like this album, as some of the songs personally resonate with me. The album opens with the Rick Bowles-Josh Leo composition “Still Goin’ Strong”, a moderate rocker, that features Jim Horn on tenor sax. Next up is “T.L.C.A.S.A.P” a song penned by the Baker-Myers duo. This song only reached #7 but likely would have been a number one a few years earlier. “Katy Brought My Guitar Back Today” is a tender slow ballad that had little potential for use as a single. Ditto for the Mark Alan Springer ballad “On This Side of The Moon”. “Cheap Seats” was the only song from this album that was made into a video. I’ll keep the pedal to the floor till we see the morning light. If we let them we’ll lose our love. We’re gettin out of here. Jeff Cook had a hand in writing “This Love’s On Me” a kind of generic up-tempo rocker that, this time featuring Jim Nelson on tenor sax. Jeff Cook handles the lead vocals on this track. “Clear Water Blues” , another Gentry- Rogers-Fowler collaboration, was not on the cassette version of this album, but was on the CD version as a ‘bonus’ track. The song is a gentle jazzy ballad which features harmonica, banjo, organ and trumpet as integral parts of the arrangement. Teddy Gentry takes the lead vocals on this song and does an excellent job of it. “A Better Word For Love” is another track not found on the original cassette release, but available as a CD ‘bonus track’. The song was written by Andy Anderson (of NRBQ) and Gary Nicholson and is yet another gentle ballad. NRBQ would record the song on one of their albums. The final song, Becky Hobbs’ excellent “Angels Among Us” has an interesting history. Unlike the rest of the album, this track was produced by Teddy Gentry. Not only did Becky Hobbs include the song on her excellent 1994 album The Boots I Came to Town In, but the Alabama album track received considerable attention at county radio and twice entered the country charts from unsolicited airplay: reaching # 54 in 1994, and later clocking in at # 28 in January 1995. The sonmg charted again for Alabama at #22 on Billboard’s Bubbling Under Hot 100 chart in January 1996. Maybe Alabama should have issued the song as an official single! The choir on this song was provided by the Sanctuary Choir & Young Musicians Choir of First Baptist Church, Fort Payne, Alabama. It was gettin’ late, and I was scared and alone. This wasn’t Alabama’s best album but a strong album worth a B+. I liked all three released singles, and while “Angels Among Us” wasn’t released as a single, I have several friends who consider the song to be their favorite Alabama song. Since the album tracks were all at least passable, and most very good, no one should be disappointed with this album. Alabama’s fourteenth album for RCA, American Pride, was their third produced in conjunction with Larry Michael Lee and Josh Leo. The album, released in August 1992, spawned four singles. Slick rocker “Take A Little Trip” previewed the record and hit #2. A tale about a couple with ambitious dreams planning a staycation, the song employed heavy drums and guitars and allowed for a gravely lead vocal from Randy Owen. Final single “Hometown Honeymoon,” which peaked at #3, continued in this theme. While the latter features a fiddle-laced production I love, neither song is lyrically memorable and all but forgotten today. The hometown theme spreads to “Homesick Fever,” which is a love-where-you’re-from mid-tempo southern rocker that’s good but nowhere near great. A more generic focus on Americana is found on the title track, the album’s most personal song thanks to Owen’s sole writing credit. He keeps the details generic, but the ballad has heart. While listening to American Pride for review I was surprised to learn “Richard Petty Fans” was a tender ballad and not the rocker the title suggests. It certainly works, but the results feel like a typical Alabama piano ballad but with a tight focus. The dreadful “You Can’t Take The Country out of me” has the vibe of “Pass It On Down” mixed with a lyric that mirrors “Down Home.” From the token banjo that opens the track to the southern gothic rock atmosphere, I genuinely dislike everything about this song. The second single, and the only chart topper from American Pride, is arguably their most iconic radio offering from the 1990s. “I’m In A Hurry (And Don’t Know Why)” is brilliant commercial contemporary country music – an engaging melody (featuring drums and guitars with ample breathing space) mixed with a memorable chorus and distinct harmonies. It’s also a great song, built from a premise seemingly without promise. For the requisite ballad single, the band offered “Once Upon A Lifetime.” The #3 peaking song tries to update their watered down slow jams from the previous decade but fails to give the listener anything interesting or exciting. I give them points for attempting to give radio a sincere love song but they shouldn’t have so blatantly mailed in their efforts. The ballads only get worse from there. Jeff Cook co-wrote and takes the lead on “Pictures and Memories,” a track that feels like a left over from the early 1980s. I would’ve enjoyed it more had the overall vibe leaned country in even a slightly noticeable way. “Sometimes out of Touch,” which features Teddy Gentry on lead vocal, also has a dated sound. But the piano flourishes and Gentry’s interesting vocal tone keep the track from joining the others at the bottom of the remainder bin. “Between The Two of Them” appears on American Pride in its original form. A deep album cut for the band, it would be a single from Tanya Tucker in 1994. There’s no arguing that she has the better version. Alabama’s take on the ballad is far too slow and lacks any country signifiers to make it interesting. I had been gunning to review American Pride since I love “I’m In A Hurry” and “Hometown Honeymoon” so much. 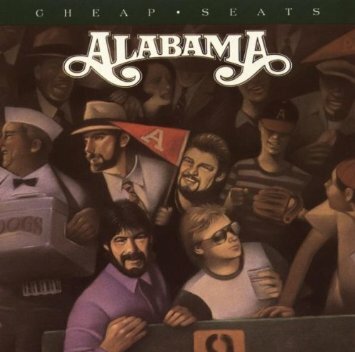 It’s also one of the first Alabama albums I purchased when I began listening to country music about twenty years ago. But neither of those things excuses the fact that American Pride is nothing more than a bizarre album. Listening thru, it’s obvious this is nothing more than a commercial album frontloaded with the four offerings suitable for radio while the remaining seven tracks have little to no value for the listener. In most respects, it’s hard to even categorize American Pride as a country album at all. As Alabama celebrated a decade of almost uninterrupted number one hits, the world of country music was changing. The New Traditionalists had prompted a retreat from more pop-tinged sounds, while the Garth Brooks phenomenon was about to explode. Southern Star had seen them holding their own, but its 1990 follow-up had a lot riding on its shoulders. Produced by the band with Josh Leo and Larry Michael Lee, there were five successful singles, but signs of a slight slowdown in their reception by country radio. The apocalyptic green vision of the title track was only the band’s second single in 10 years not to reach the top of the charts, peaking at a still more than respectable #3. Written by Randy Owen and Teddy Gentry with Will Robinson and Ronnie Rogers, and given a fairly beefy country-rock production, it shares the earnestness of John Anderson’s songs on the same theme. The regretful lost love ‘Jukebox In My Mind’ took them back to the top. 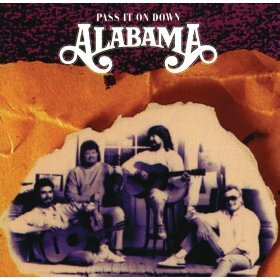 Opening with the sound of a, it is one of my favourite Alabama singles, with a prominent fiddle in the arrangement. The ballad ‘Forever’s As Far As I’ll Go, written by Mike Reid, was a top 15 Billboard Adult Contemporary hit as well as a country #1. The last chart topper, ‘Down Home’, an ode to rural hometowns (“where they know you by name and treat you like family”), written by Rick Bowles and Josh Leo, is quite agreeable. The final single from the record was ‘Here WeAre’, written by Beth Nielsen Chapman and Vince Gill, and stylistically more characteristic of some of Chapman’s work than Gill’s. It is quite catchy and radio-friendly, but lacks emotional depth. While the performance of ‘Pass It On Down’ might have been passed off as a blip, ‘Here We Are’s #2 peak was a more significant indicator marking the group’s beginning to falter with radio. Although they continued to score hits, they would only get two more #1s. The story song ‘Fire On Fire’, written by Teddy Gentry with Ronnie Rogers and Greg Fowler, has a potentially interesting lyric about a woman hooking up with a stranger in town, but the melody, arrangement and Cook’s weedy lead vocal are all more AC/rock ballad than country, and not particularly suited to the song’s tale of intense but temporary passion. The country-rock ‘Until It Happens To You’, written by Cook, Gentry, Rogers and Fowler, and sung by Gentry, is better. The mid-tempo celebration of partying in the open air, ‘Moonlight Lounge’ (another Rogers tune), is okay in itself, but the now overdone theme makes it less welcome. The Caribbean-tinged beach tune ‘Gulf Of Mexico’ with its steel drums and la-la-las isn’t quite to my taste, but is inoffensive with a pleasant melody. This was one of three tracks omitted from the original cassette release and only available on CD (then the more expensive version). Of the others, ‘Starting Tonight’ is a romantic ballad which is okay. A more interesting choice was the bluesy ‘I Ain’t Got No Business Doin’ Business Today’, a cover of a top 10 hit for Razzy Bailey in 1979 (and previously recorded by the great George Jones on his 1978 album Bartender’s Blues). This was fairly standard fare from Alabama, with plenty to appeal to fans of the band. Alabama arrived on the national stage in 1980 at a time when country music was dominated by crossover acts. By mid-decade, however, the pendulum had swung wildly in the opposite direction and by the end of the decade, many veteran acts had been swept off the charts altogether. Those that survived the tide change were forced to adopt a more traditional sound in order to remain relevant. 1989’s Southern Star was Alabama’s back-to-basics album — sort of. While it was less slickly-produced than most of their earlier albums, a traditional album it is not. The radio singles were carefully crafted to appeal to the change in commercial tastes, but on the album cuts the band continued to explore different styles, including Southern rock and pop. Southern Star found the band working with a new production team. Gone was Harold Shedd, who had co-produced all of their albums for RCA, and in his place were Barry Beckett; Larry Michael Lee, and Josh Leo. The album continued Alabama’s winning streak on the singles charts, with all four of its singles reaching #1, starting with “Song of the South”, a catchy Bob McDill number that had been recorded several times previously — originally by Bobby Bare, and later by Johnny Russell and Tom T. Hall with Earl Scruggs. Ballads were always a strong point for the band and the excellent “If I Had You”, the album’s second chart-topper was no exception. The uptempo “High Cotton” takes a look back through rose-colored glasses at growing up during the Great Depression, and “Southern Star” gives Alabama an opportunity to showcase their tight harmonies. The rest of the songs on Southern Star could have appeared on any of Alabama’s previous albums. Though the production is more organic, the songs occasionally stray into different musical territory. “Down On The River” is pleasant if not particularly memorable Southern rock song. “She Can” is pop-flavored number that is somewhat marred by a synthesizer, “Dixie Fire”, featuring Jeff Cook on lead vocals, is similarly dated sounding. “Barefootin'” (another Cook-led effort) is a throwaway number with annoying horns. The Randy Owen-penned “Ole Baugh Road” is one of the better album cuts. The Spanish-tinged “The Borderline”, with Teddy Gentry singing lead with guest Charlie Daniels, is the album’s biggest creative stretch. Though not without its missteps, Southern Star proved that Alabama was able to adapt to changing commercial tastes and remain relevant after nearly a decade on charts. It was a great way to close out the decade and the album is still worth listening to today. With the release of 1988’s Workin’ Band, The Nitty Gritty Dirt Band began to wind down its most commercially successful decade. It was the band’s final “regular” album of the decade and its last for Warner Bros.; the following year’s album and their Universal debut would be the much-acclaimed and guest star-studded Will The Circle Be Unbroken?, Volume II which we reviewed in April 2009 . Like the previous year’s Hold On, Workin’ Band was produced by Josh Leo. It produced three Top 10 singles, beginning with “Workin’ Man (Nowhere To Go)”, a #4 peaking hit that despite its uptempo arrangement, dealt with the plight of American farmers who were displaced after losing their farms at auction. It was followed by another uptempo, radio-friendly number “I’ve Been Lookin'”, which reached #2. Both songs were penned by band members: Jimmie Fadden wrote “Workin’ Man” and Jimmy Ibbotson and Jeff Hanna penned “I’ve Been Lookin'”. The third single, “Down That Road Tonight” was written by Jeff Hanna with Josh Leo and Wendy Waldman. My least favorite of the three singles, “Down That Road Tonight” contains just a hint of the blues. It reached #6 and marks the second-to-last time The Nitty Gritty Dirt Band would score a Top 10 hit (“When It Goes” from the Circle II collection became their final Top 10 in 1990). Two of the album’s tunes were later covered by other artists. Holly Dunn released a very similar version of “Thunder and Lightnin'” a year later and Lorrie Morgan recorded a much slicker version of “Soldier of Love” in 1996, which pales in comparison to NGDB’s rendition. Band member Bob Carpenter contributed two of his original compositions to the project: “Baby Blues”, a co-write with Wendy Waldman and “A Lot Like Me”. Both are departures from the band’s usual sound. Carpenter takes over as lead vocalist and though he is not as gifted a singer as his bandmates, he is effective on both tunes, particularly the rock-infused “A Lot Like Me”, that I liked a lot more than I expected to. Workin’ Band was always one of my favorite Nitty Gritty Dirt Band albums. I bought it on cassette when it was released in 1988, but never upgraded it to CD. Consequently, I had not heard it in a very long time, but it has held up surprisingly well and I found that I enjoyed it as much as I did over quarter-century ago. Kathy Mattea’s early-90s experimentation with Celtic and folk sounds resulted in a predictable decline in her chart performance. By 1994 she hadn’t had a Top 10 hit in three years, so she switched producers and made a conscious effort to release an album with a decidedly more commercial sound. Her only album produced by Josh Leo, Walking Away a Winner includes more upbeat, mainstream-sounding songs than Time Passes By and Lonesome Standard Time, and the strategy to reverse her commercial fortunes was at least initially effective. The title track and lead single, written by Bob DiPiero and Tom Shapiro, peaked at #3, becoming the final Top 10 hit of Kathy’s career. It reminds me of some of Mary Chapin Carpenter’s upbeat material, as does the follow-up single “Nobody’s Gonna Rain on Our Parade”. It’s interesting that two such similar singles were released back-to-back; after the success of “Walking Away a Winner”, Mercury likely thought that “Nobody’s Gonna Rain on Our Parade” would easily sail into the Top 10, but the strategy misfired; the record stalled at #13, though it did fare slightly better in Canada, topping out at #8 there. In the ballad “Maybe She’s Human”, Kathy takes up the cause of a put-upon wife and mother who is struggling — not always successfully — to juggle career and family responsibilities. It is rather similar in theme to Reba McEntire’s “Is There Life Out There” from a few years earlier, but it was met by a big yawn from radio and it only reached #34. The final single “Clown In Your Rodeo” is a feistier take on the same theme. I like this one a lot. It didn’t get the attention it deserved, but it does bear the distinction of being Mattea’s final Top 20 hit. There are some excellent tracks among the album cuts; my favorite is the light-hearted “The Cape”, written by Jim Janosky, Guy Clark, and Susanna Clark. It is not, as the title might suggest, a song about Cape Cod, but rather a tune about a child who is pretending to be a superhero and believes he can fly. The more serious “Another Man” finds Mattea confronting her husband and telling him that she’s in love with someone else. The twist here is that he is not the same man she married and she still loves the man he used to be. This type of song used to be a staple at country radio and in another era it might have been a big hit. The album closes with the poignant “Who’s Gonna Know”, written by Kathy’s husband Jon Vezner. In this one, she’s looking at an old childhood photograph of herself and her now-aging parents, and contemplating the day when they are no longer with her. It’s a bit unsettling, perhaps because it’s something to which most of us can relate. Despite a tepid reception at radio, Walking Away a Winner sold respectably; it was Kathy’s last album to earn gold certification. Its lack of radio hits may mean that some fans may have overlooked the album when it was initially released. Those fans would be well advised to give the album a listen now, because there is much here to like. Inexpensive copies are easy to find at retailers such as Amazon. The 1990s were a period in which Dan Seals saw a rapid decline in his commercial appeal. He began the decade strongly enough with two # hits: “Love On Arrival” and “Good Times”, but none of his subsequent releases managed to crack the Top 40. A change in record labels did not help to reverse the trend; he signed with Warner Bros. in 1991 and released his first album for the label the following year. Walking The Wire became his first album not to chart since Harbinger, which had been released a decade earlier, prior to his commercial breakthrough. But despite its lack of commercial success, Walking The Wire is a solid set of songs and one of the better albums in the Seals discography. Things got off to a rocky start with his first single for his new label, a Jesse Winchester tune called “Sweet Little Shoe”, which was released in 1991, in advance of the album. An overproduced number designed to cash in on the then-popular line dancing craze, it died a quick and well deserved death on the charts. Peaking at a meager #62, it is easily the worst song on the album. The follow-up single “Good Goodbye” did not chart and was not included on the album when Walking The Wire was released the following year. The self-penned “Mason Dixon Line”, which examines a relationship between two very different people, fared a little better. It reached #43, but deserved to chart higher, as it is a decent song. Andrea Zonn, who played in Vince Gill’s road band at the time, plays fiddle on the track. The catchy “When Love Comes Around The Bend” was released next. Written by Josh Leo, Pam Tillis, and Mark Wright, the tune had been a minor success for Juice Newton a few years earlier. While her version managed to crack the Top 40 (just barely), Seals’ version only climbed to #51. This one might have enjoyed more success if it had been released a few years earlier before his career lost its momentum. The final single was another Seals composition, the well-meaning but somewhat preachy “We Are One”, which appeals to mankind to put aside religious, ethnic and racial differences. It did not chart. The remaining songs on the album tend to be rather low-key, tastefully produced affairs. I particularly like “A Good Rain”, which is about a farmer struggling to make ends meet, and “Slower”, a tune written by Tony Arata about young love. The Parker McGee-penned “Someone Else’s Dance” is also quite good. “Sneaky Moon” is enjoyable, but I prefer the Tanya Tucker version that appeared a year later. I wasn’t familiar with any of the songs on this album prior to preparing for this review, and as a hitless collection that appeared as Dan’s major label career was beginning to wind down, I expected it to be a dull and lifeless affair. I was, however, quite pleasantly surprised and I’m at a loss to explain why it was such a commercial disaster. Perhaps Seals didn’t get the proper level of promotion from his new label, or perhaps at age 44 he was considered to be past his peak in an era that saw a lot of new and younger talent emerge. Regardless of the reason, it’s unfortunate that it didn’t receive more love from radio and retail. It is available very inexpensively from Amazon and despite a few missteps, is well worth the modest investment. Matraca Berg’s first success in country music came in 1983 when she was 19 years old and co-wrote “Faking Love” with Bobby Braddock, which became a #1 for T.G. Sheppard and Karen Brooks. Her next big success came four years later when Reba McEntire scored a #1 hit with “The Last One to Know”, which Berg had co-written with Jane Mariash. Matraca became a recording artist when she landed a deal with RCA in 1990. Lying to the Moon, her first project for the label, was produced by Josh Leo and Wendy Waldman, and consisted of ten top-notch songs, all of which Matraca had a hand in writing. It isn’t clear to me why the album didn’t enjoy more commercial success. While not quite in the same league as Reba McEntire and Trisha Yearwood, Matraca was an above-average vocalist and was reasonably attractive — and therefore, marketable. The material, which was first-rate and designed to appeal to mainstream listeners, was certainly not at fault. Nevertheless, Lying to the Moon was only moderately successful. “Baby, Walk On”, the first single, is not the strongest or most original song on the disc, but it was an uptempo number that was well within the constraints of what country radio was playing at the time. The follow-up, “The Things You Left Undone”, which I like much better, is another uptempo number about an independent-minded woman who is picking up the pieces and getting on with her life after the end of a relationship. At the time, I really thought this one would be a huge hit, but like its predecessor, it peaked at #36. The two songs, which were co-written with frequent collaborator Ronnie Samoset, are Berg’s highest charting singles as a recording artist. The jazzy “I Got It Bad”, which finds her waiting for the phone to ring and obsessing over a new love interest only reached #43, and the excellent “I Must Have Been Crazy”, which which she’s fighting off madness — without much success — after another bad break-up, died at #55. My favorite track and perhaps the best known is the beautiful title track, which features a haunting cello solo. Berg re-recorded the song for her second album, The Speed of Grace, a pop effort that was released in 1994. In between those two versions, Trisha Yearwood covered it for her The Song Remembers When album, which was released in 1993. The original version resurfaced on a compilation album in 1999. RCA released it as a single and had a video produced, but by that time Berg’s career momentum had been lost and the record failed to chart. A handful of the other tracks showcase Matraca’s considerable talent as a songwriter and a storyteller. “Calico Plains”, written with Mike Noble, tells the story of two young girls growing up in the midwest. Abilena has big dreams and is planning to leave her hometown to pursue them, while her friend, who acts as the song’s narrator makes her promise to write. Then Abilena falls pregnant and is forced to marry the baby’s father. Several years and a few children later, it is the narrator who is leaving to pursue bigger and better things and promising to write to Abilena. “Appalachian Rain”, which features harmony vocals from Emmylou Harris, tells of a young unwed mother who is forced to leave her Appalachian home to spare her family’s honor, and “Alice in the Looking Glass” tells the story of a lonely middle-aged hairdresser who was once a homecoming queen, who puts on a brave face for her customers. My least favorite track is the album closer “Dancin’ on the Wire”, which Berg co-wrote with producers Leo and Waldman. The lyrics are on the shallow side and this is the one instance on the entire album where the production is a bit heavy-handed. It’s a shame that this album didn’t fare better at radio and retail, though Matraca’s subsequent career decisions suggest that even if it had, her commercial success would not have been long-lived. RCA refused to release her next album because they felt it didn’t have enough mainstream appeal, and her next effort The Speed of Grace, was released by the label’s pop division, and Matraca’s subsequent albums appeared infrequently on smaller, now-defunct labels. Lying to the Moon is out of print in CD form but used copies can be found very cheaply. It is not to be confused with the 1999 compilation album Lying to the Moon & Other Stories, which contains eight of the orginal album’s ten tracks. It too can be purchased very inexpensively used and might be a slightly better value.